In a probabilistic model, a rare event is an event with a very small probability of occurrence. The forecasting of rare events is a formidable task but is important in many areas. For instance a catastrophic failure in a transport system or in a nuclear power plant, the failure of an information processing system in a bank, or in the communication network of a group of banks, leading to financial losses. Being able to evaluate the probability of rare events is therefore a critical issue. Monte Carlo Methods, the simulation of corresponding models, are used to analyze rare events. This book sets out to present the mathematical tools available for the efficient simulation of rare events. Importance sampling and splitting are presented along with an exposition of how to apply these tools to a variety of fields ranging from performance and dependability evaluation of complex systems, typically in computer science or in telecommunications, to chemical reaction analysis in biology or particle transport in physics. 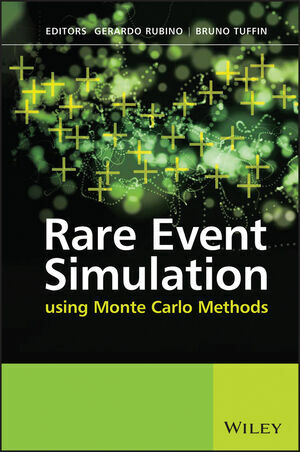 Graduate students, researchers and practitioners who wish to learn and apply rare event simulation techniques will find this book beneficial. Gerardo Rubino, Research Director, the Institute of Computer Science and Random Systems Research (INRIA) INRIA Rennes - Bretagne Atlantique Research Centre Campus universitaire de Beaulieu. Bruno Tuffin, Research Associate, the INRIA IRISA/INRIA. 1 Introduction to Rare Event Simulation (Gerardo Rubino and Bruno Tuffin). 2 Importance Sampling in Rare Event Simulation (Pierre L’Ecuyer, Michel Mandjes and Bruno Tuffin). 3 Splitting Techniques (Pierre L’Ecuyer, François Le Gland, Pascal Lezaud and Bruno Tuffin). 4 Robustness Properties and Confidence Interval Reliability Issues (Peter W. Glynn, Gerardo Rubino and Bruno Tuffin). 5 Rare Event Simulation for Queues (José Blanchet and Michel Mandjes). 6 Markovian Models for Dependability Analysis (Gerardo Rubino and Bruno Tuffin). 7 Rare Event Analysis by Monte Carlo Techniques in Static Models (Héctor Cancela, Mohamed El Khadiri and Gerardo Rubino). 8 Rare Event Simulation and Counting Problems (José Blanchet and Daniel Rudoy). 9 Rare Event Estimation for a Large-Scale Stochastic Hybrid System with Air Traffic Application (Henk A. P. Blom, G. J. (Bert) Bakker and Jaroslav Krystul). 10 Particle Transport Applications (Thomas Booth). 11 Rare Event Simulation Methodologies in Systems Biology (Werner Sandmann).